The Liberty Double Eagle with Motto was produced from 1866 to 1876. This was the second type of Twenty dollar gold coins made. These coins have the distinction of being the first coins of this denomination to bear the motto "IN GOD WE TRUST". 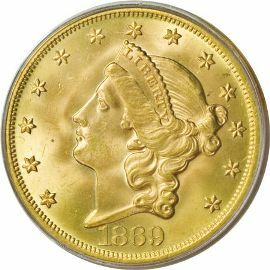 Over the eleven year term of this variety these gold coins were minted at three different US mint facilities including: Philadelphia, Carson City, and San Francisco. with the word "LIBERTY". The entire design is surrounded with 13 stars that signify the thirteen original colonies. Below the design reads the date. The reverse has the same basic look with a couple of modifications. 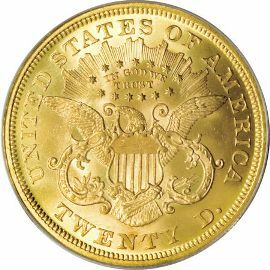 On the Type 2 coins, the sides of the shield on the eagle’s breast are slightly curved out from the center. On earlier coins the sides of the shield are straight. Another little known change was with the eagle’s tail feathers, they are slightly longer on this variety than the earlier one.